At the risk of sounding syrupy-sweet or like I'm gushing, I really am flattered and grateful to see that readers continue to pen reviews of the Sasha Jackson Mysteries. Just this week, a reader posted this review of Blood and Groom (2009) on Amazon: "This was a good mystery book with lots of humor, interesting characters, and several interwoven plots." A few weeks previous, another reader reviewed The Lies Have It (2011) on Amazon, saying: "In the Lies Have It she delivers another well paced well written adventure for Sasha. The plot moves at a good pace and the mysteries are well written so you do not solve too quickly." And of Dead Light District (2011), a reader recently said this on Amazon: "Having said that I really, really liked Sasha, she was a hoot. Smart, sassy and a little self effacing. She had it all going on..."
There have also been a few reviews recently on GoodReads, and these too have made me smile! I feel I can speak for ALL authors when I say that reviews are welcome! It's so nice to get a response from a reader. I really do appreciate it when a reader takes the time to post a comment online. Feedback from people always gives me that little boost during those moments when writing frustrates me. It really does help to keep me pushing forward! Thanks folks! 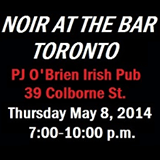 EVENT DETAILS: Our Toronto authors on Thursday May 8th include John McFetridge, fresh off the launch of BLACK ROCK, Howard Shrier whose MISS MONTREAL has been long-listed for the Arthur Ellis Best Novel, Jill Edmondson of Sasha Jackson fame, and Andrew Pyper, whose THE DEMONOLOGIST is a finalist for the 2014 International Thriller Writers Award for Best Novel. MCs Tanis Mallow and Rob Brunet will be reading as well, Brunet from STINKING RICH which debuts summer 2014. We've got three out-of-town guests to juice the party: Owen Laukkanen of Vancouver just back from his U.S. tour for KILL FEE; Hilary Davidson, up from NYC to launch BLOOD ALWAYS TELLS; and Terrence McCauley, also of NYC, fresh off his triple New Pulp Award wins for best author, best novel (SLOW BURN), and best short story. There's no cover, and PJ O'Brien's got a great pub menu if you're coming straight from work. Doors open 6:30 p.m. Short readings every half hour or so after that. For more info please check THIS LINK. 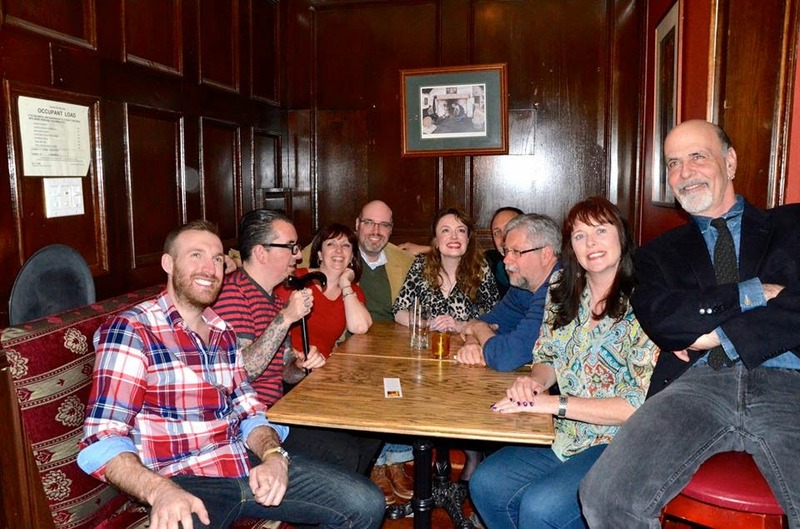 Here's a picture of all the usual suspects at the end of the evening. It was such a fun event and the place was packed!